For once, it was easy being green for Kermit the Frog. The Jim Henson-created puppet, who has lamented his verdant color in the song "It's Not Easy Being Green," was honored Thursday with the 2,208th star on the Hollywood Walk of Fame. Other fantasy characters with names embedded in the walk include Mickey Mouse, Big Bird, Woody Woodpecker and Bugs Bunny, according to the Hollywood Chamber of Commerce. 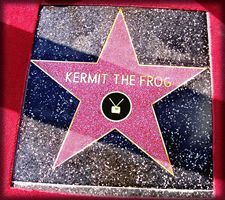 Puppeteer Steve Whitmire, who has worked with the Muppets since 1978, manipulated and voiced Kermit from beneath a Hollywood Boulevard stage constructed for the ceremony, which attracted scores of onlookers. Among the celebrity guests was actor David Arquette, who appears in the upcoming NBC special "It's a Very Merry Muppet Christmas Movie." Jane Henson, widow of the late Jim Henson, and members of her family also attended. The Muppets first appeared on a local Washington, D.C., television program "Sam and Friends." 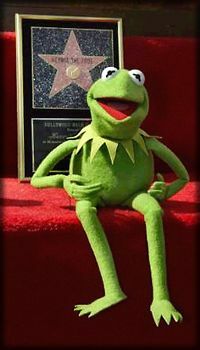 Kermit made his debut on the show, which won a local Emmy in 1959. Henson, who died in 1990, brought his puppets to the big screen in 1979 with "The Muppet Movie," followed by "The Great Muppet Caper" in 1981 and 1984's "The Muppets Take Manhattan," which ended with the marriage of Kermit and longtime paramour Miss Piggy. Kermit was also the star of the 1976-1981 "The Muppet Show." A miniature version of his character appeared in the cartoon show "Muppet Babies".